MAASTRICHT, September 13th 2017 – This is the first of a series of logbook entries we will write this year on materials. Inspired by Rachel Harkness’ An Unfinished Compendium of Materials, this is an incomplete list of different materials we have thought about in relation to how medical students train their sensory skills of physical examination. A word about materials. There has been much discussion about this in the humanities and social sciences, often labelled as the “material turn”. The disciplines within and between which we work have been thinking about materiality for a long time; in anthropology as material culture, in STS as objects or non-humans, and in history as artefacts. In this project our exploration of what materials mean in learning skills will stem from these literatures and be developed through our own fieldwork. We will learn not only about things, but also, following from Harkness, with, from and through them. We do not have a neat definition of materials yet, nor do we expect to have one. But we do hope to have something to say about the way in which materials – whether that is also considered as resources, technologies, or another word – become enmeshed with skills, and sensory, bodily knowledge. So now to our first material: the pager. Many medical students feel like a “real doctor” when they receive their first stethoscope. For others it is when they spend time with a patient for the first time by themselves. For me, it was perhaps when I was loaned my first pager. Suddenly the medical work I had been learning moved beyond the realms of a scheduled curriculum, into the after-hours of “real” clinical work, a time when textbooks and libraries were left behind, and we were allowed, as students, into the lives of the doctors who were teaching us on the wards. Sometimes we were given a pager as a group, and once we received a message from the resident or registrar on our unit that there was “something interesting happening”, we would spread the word and gather in the hospital. It was especially exciting if this happened in the middle of the night! In other rotations we had our own pager. When we became residents the novelty soon wore off; the pager was the way in which all hospital staff communicated with us. Its beep, a sound I will never forget, could mean anything from a new drug chart rewrite to, nerve-wrackingly, a medical emergency. The pager was more than a symbolic manifestation of the profession we were entering. It was a material that was important to how we learned our clinical skills, linking us to the everyday practices of hospital medicine. 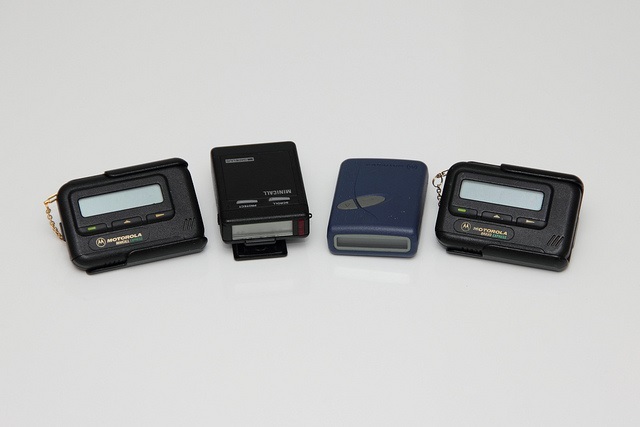 I was a medical student in the 1990s, when pagers were much more widely used than they are today. Nowadays, the medical students I follow in my ethnographic work all carry smartphones, as do the doctors who teach them. There are bean-counters however who have pointed out the financial burden of using pagers in the NHS, advocating for other digital solutions: “Pagers represent 20th-century technology and are a blunt instrument for communication.” Others argue: “They do only one task, but they do it well. They provide a last line of defence”. I remember when residents started carrying PDAs (personal digital assistants), accessing all kinds of information I couldn’t imagine having at your fingertips on the ward, away from a computer. Now the smartphone is ubiquitous in hospitals. What might these technological transformations mean for medical education, and the ways students learn on the wards? How does this influence students’ engagements with patients? These, amongst others, will be questions we will consider in our fieldwork, as well as other ways in which smartphones are used in learning and teaching. We are not only interested in what is new however, but also how “older” technologies, such as the pager, may endure in the education of doctors. Harris, Anna. (2017) “Sounds like infrastructure: Examining the materiality of pneumatic tube systems through their sonic traces” in Historicizing Infrastructure, edited by Andreas Marklund and Mogens Ruediger, Aalborg University Press. Image used under the Creative Commons lisence, from Hades2k’s Flickr page. Thanks to Annika Richterich for sending us the latest news on pagers.